How often do you require permission to fulfill your wishes, desires and wants? Many times, perhaps. Remember the times when we were sent home with a permission slip for a school field trip for our parents to sign? That was for our guardian or parents to grant permission to the school to take us outside the school boundaries. 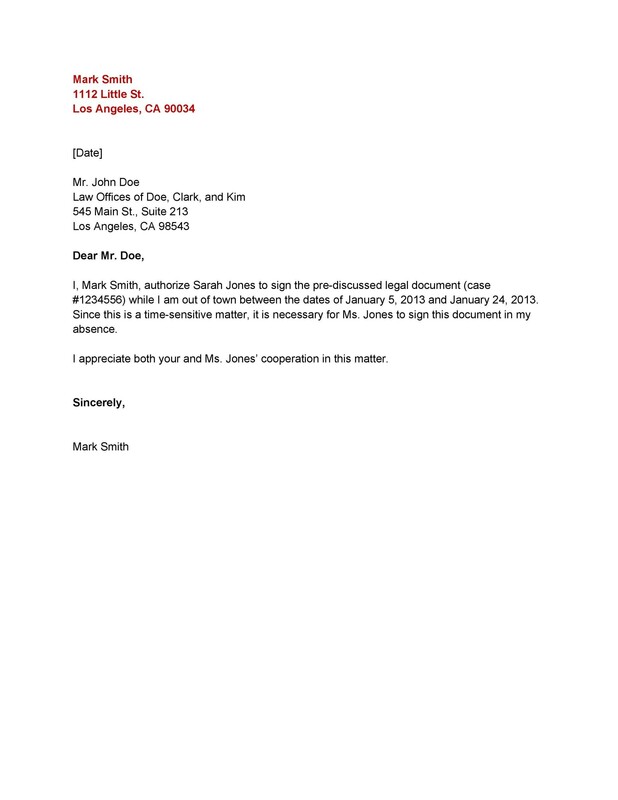 Similarly, authorization letters are used in business settings by many organizations to carry out their business activities. 2 What Exactly is a Letter of Authorization? 3 What Does an Authorization Letter Do and When Do You Need It? 5 How Many Parties are Involved in an Authorization Letter? 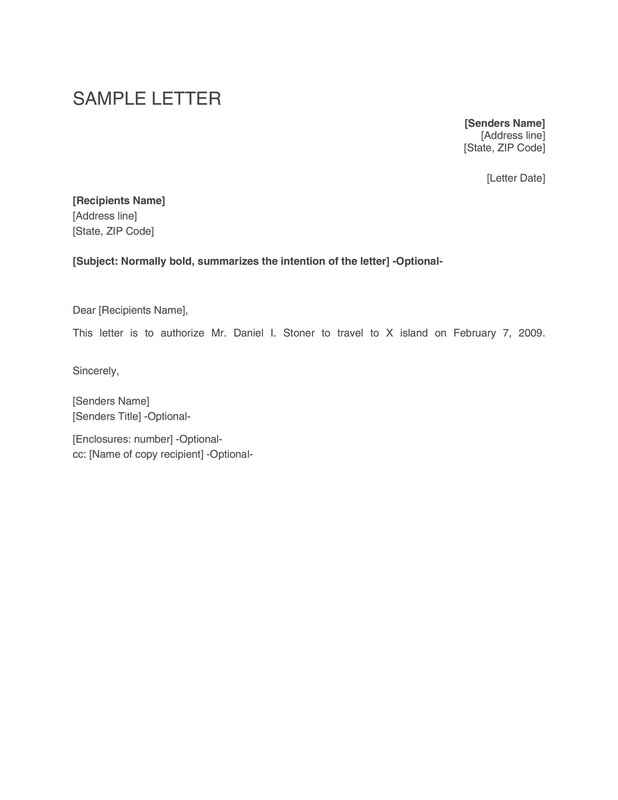 6 What are the Types of Letter of Authorization? 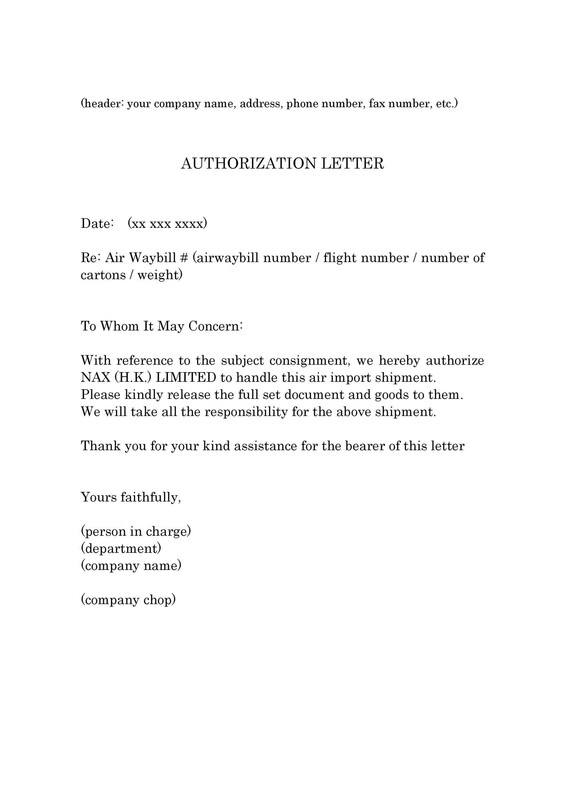 8 How to Write a Letter of Authorization? Moreover, a letter of authorization is actually designed to secure and protect both the parties. 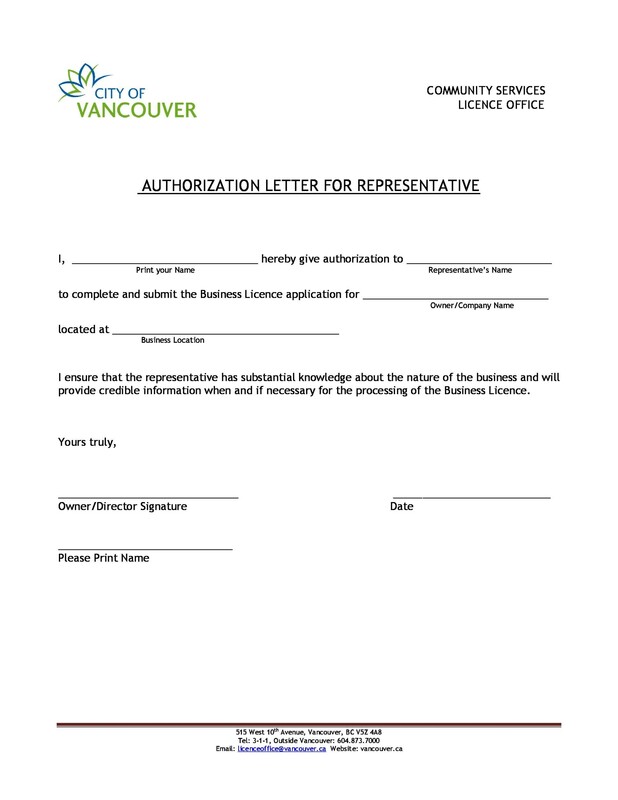 No matter what property you want to acquire or what activity you wish to perform, a letter of authorization is required by law, depending upon what is being acquired and performed. From school researches, medical and legal issues and indulging in corporate transactions, a letter of authorization is used everywhere. One cannot easily ignore the importance of this letter as it gives the power to the taker. If you want to know about the ins and outs of a letter of authorization, then you have come to the right place. Here is all you need to know about it. 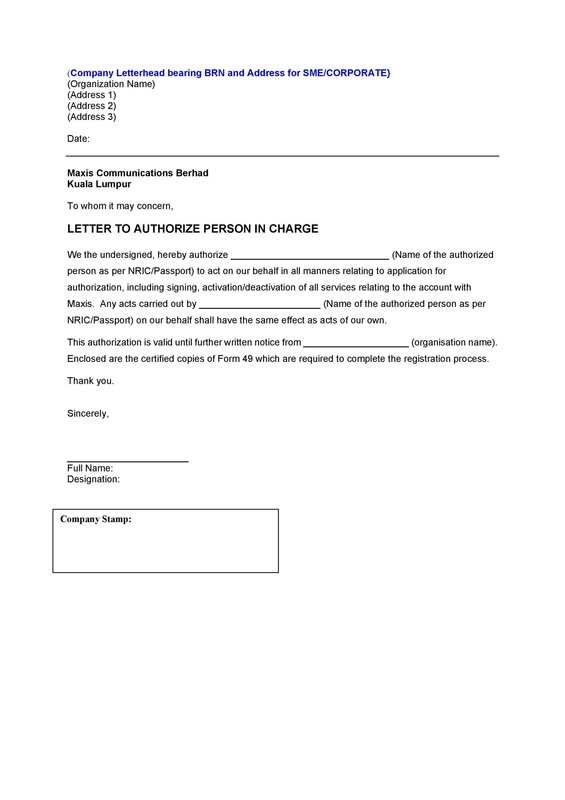 What Exactly is a Letter of Authorization? 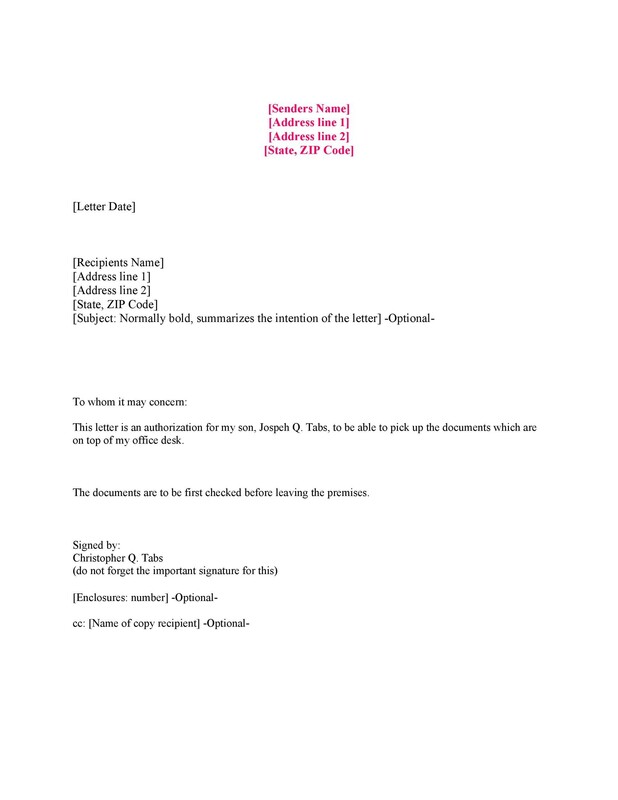 It is a written letter or document that confirms a person’s authority, rank or ability to perform or enter a legal binding contract, spend a specified sum, take a specific action or delegate their powers or duties. To be precise, you will be able to act on behalf of a third party, especially when you are unable or unavailable to act yourself. In such cases or absences, you do require someone for your assistance with legal issues, financial matters or health directives. 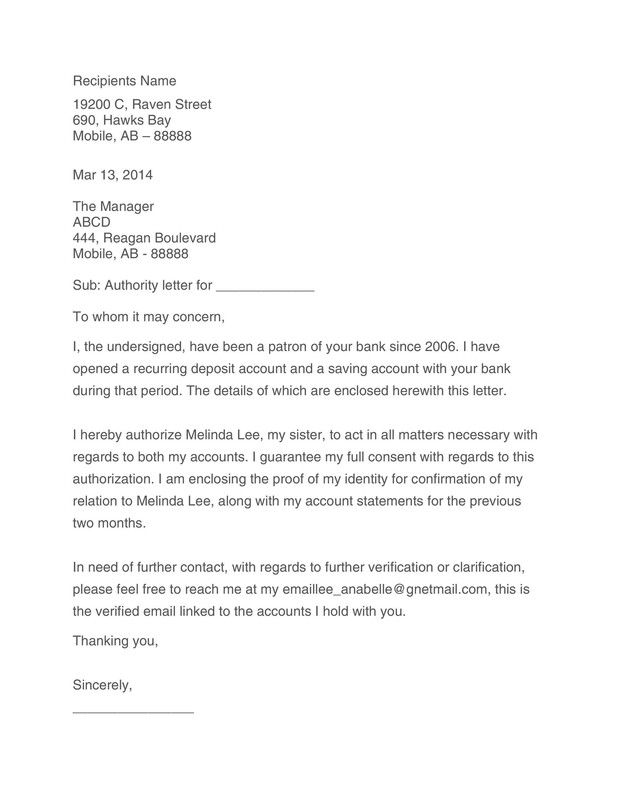 If a letter of authorization is written properly, you will surely accomplish this. 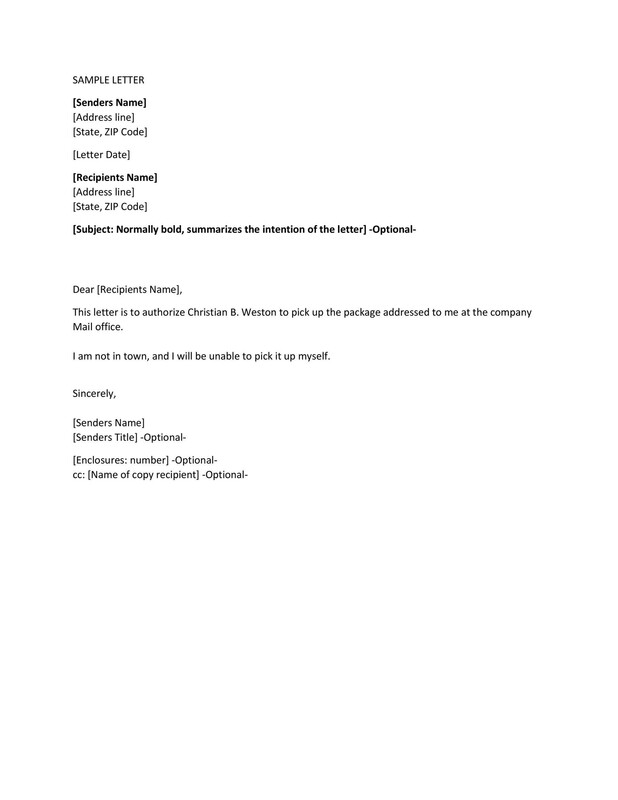 However, if you really want to avoid the mistakes, then you should read the ‘how to write a letter of authorization section below carefully, or simply download an authorization letter sample to avoid mistakes. 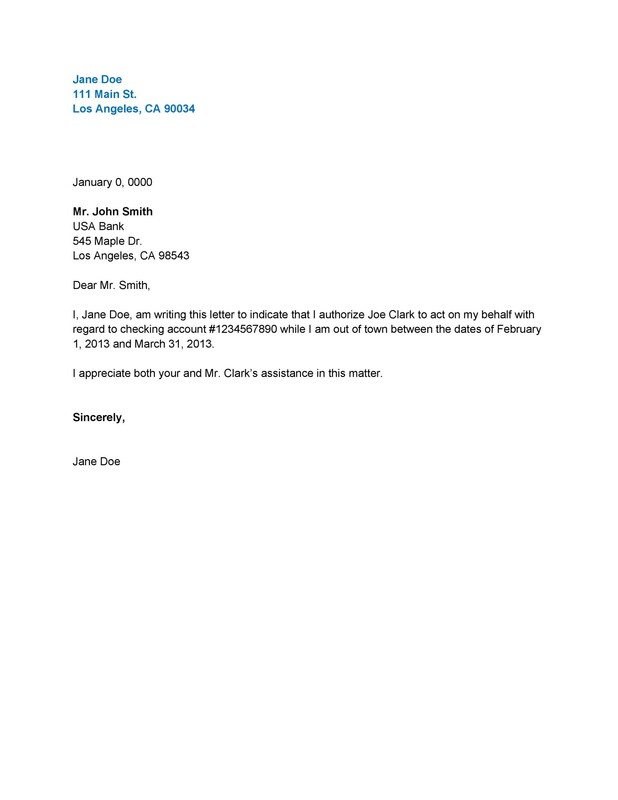 What Does an Authorization Letter Do and When Do You Need It? You may need to write it to any other person who can efficiently handle your fast moving financial transactions. 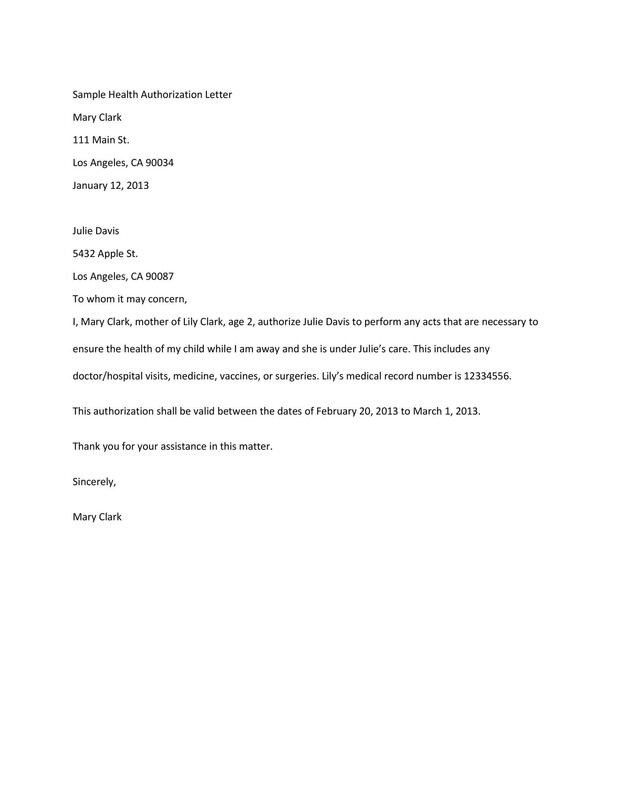 Parents or guardians may need a letter of authorization for child care workers for the basic medical emergency decisions for their children’s care. 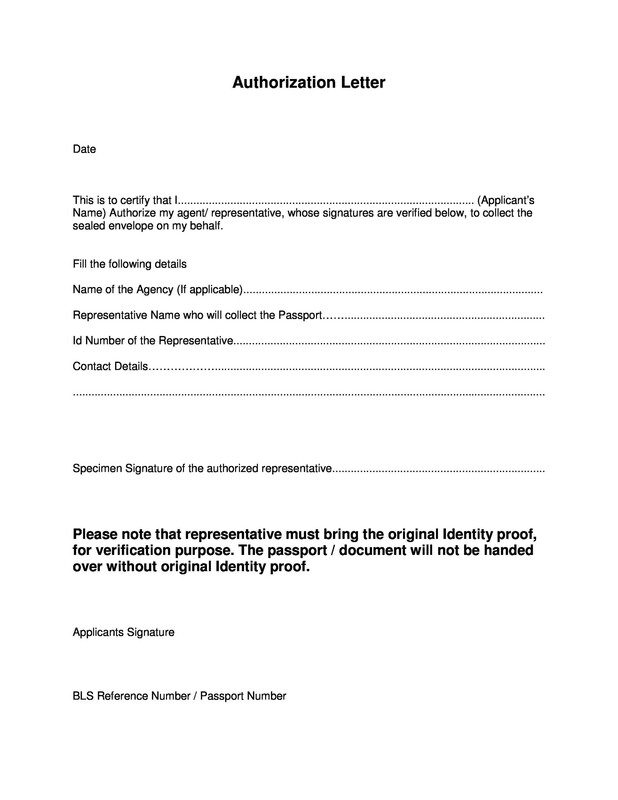 One may also need a letter of authorization if minors are not traveling with their parents or guardians. In this case, children will be protected from child custody issues and child trafficking. 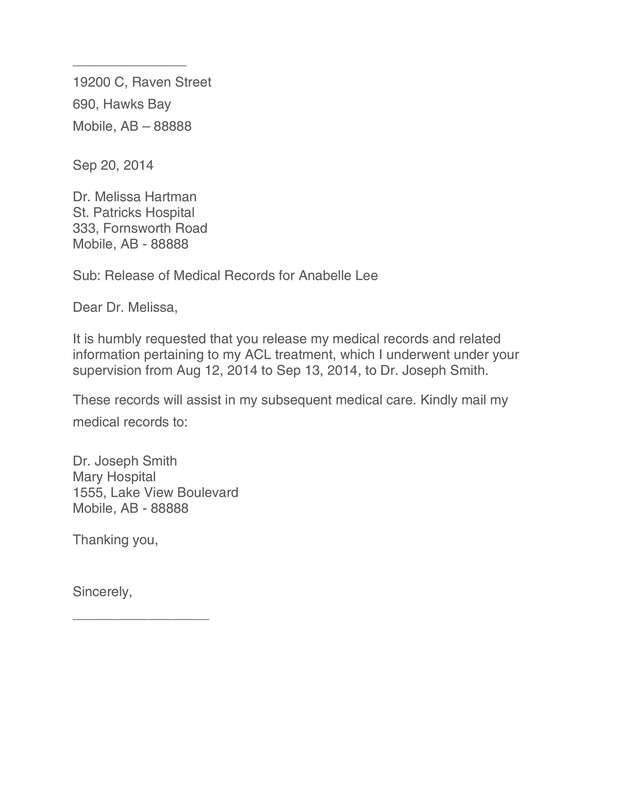 You can release all your personal information, such as medical history, using an authorization letter. 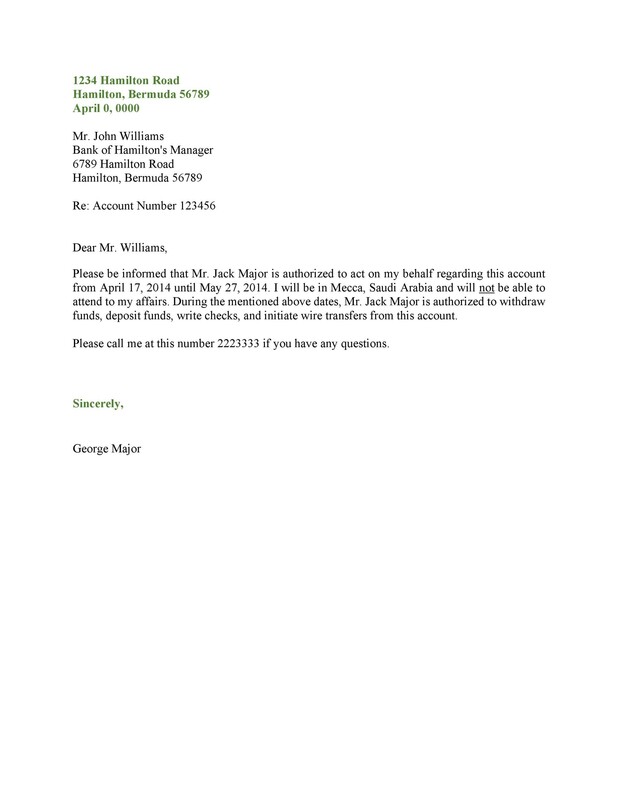 Those who have money held at the regional bank and cannot access it, they may require writing a letter of authorization permitting someone else to handle the potential issues that may arise with that financial institution or bank account. Parents may also need it to grant permission to someone to pick up their child from school when they are at work or are unavailable. A letter of authorization may be handy for people who require someone else to pick up the packages sent to them at the post office. These are also used to give publishing rights. Used when parents need to permit their children to go on field trips. Guardians may need it to permit airlines to look after their child on a flight. How Many Parties are Involved in an Authorization Letter? There are three parties involved in an authorization letter including the first, second and the third party. These three parties are the individual or entities that are directly involved in the transaction. Here are the details of all the three parties involved. First Party: The person or entity who is granting or wishes to grant the authority. They are the original and the first holder of the property. Second Party: The second party is an individual or group linked with the first party conducting the transaction. Third Party: The third party is the one who is actually receiving the authority or the one who is selected to act as a proxy in the absence of the first party. 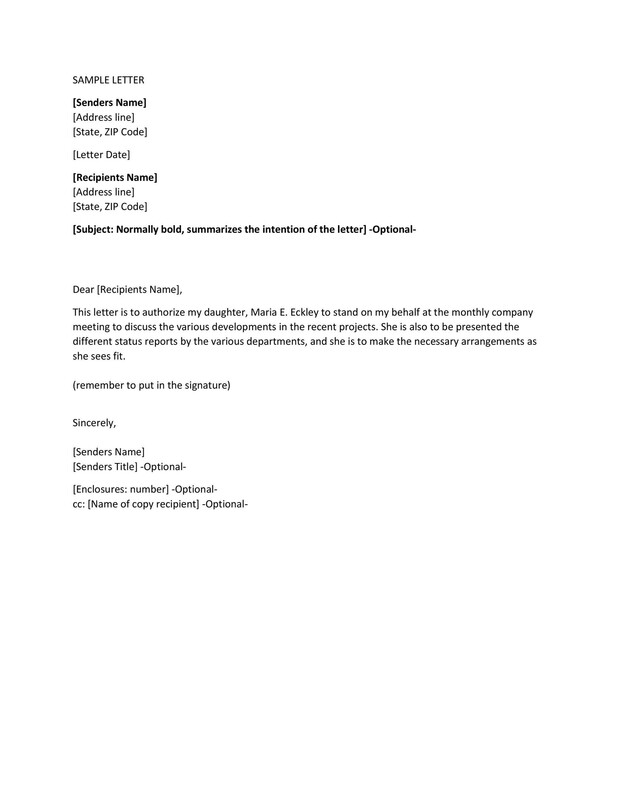 The three parties involved in the transaction process are also mentioned in the letter of authorization with their names and addresses. 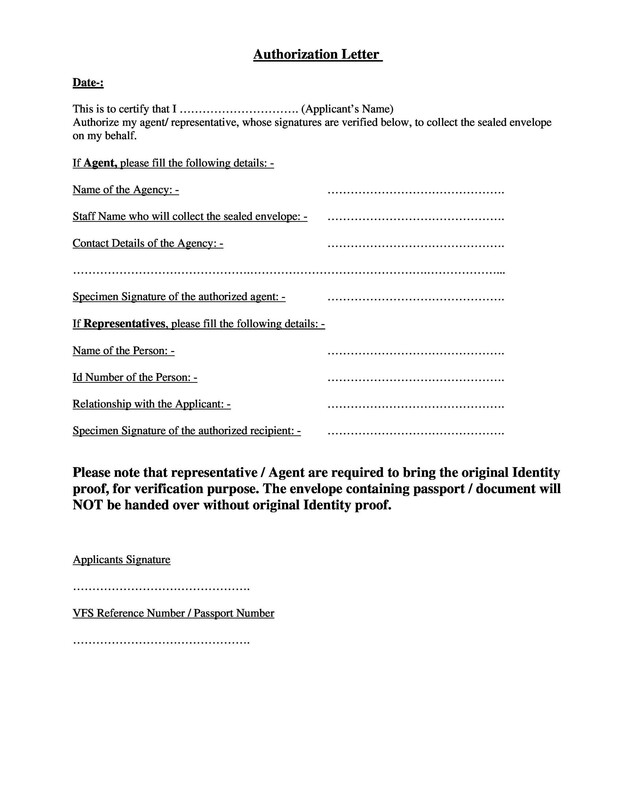 In case the second party is not known in a transaction, then you need to file an emergency action letter of authorization, addressing it To Whom It May Concern. 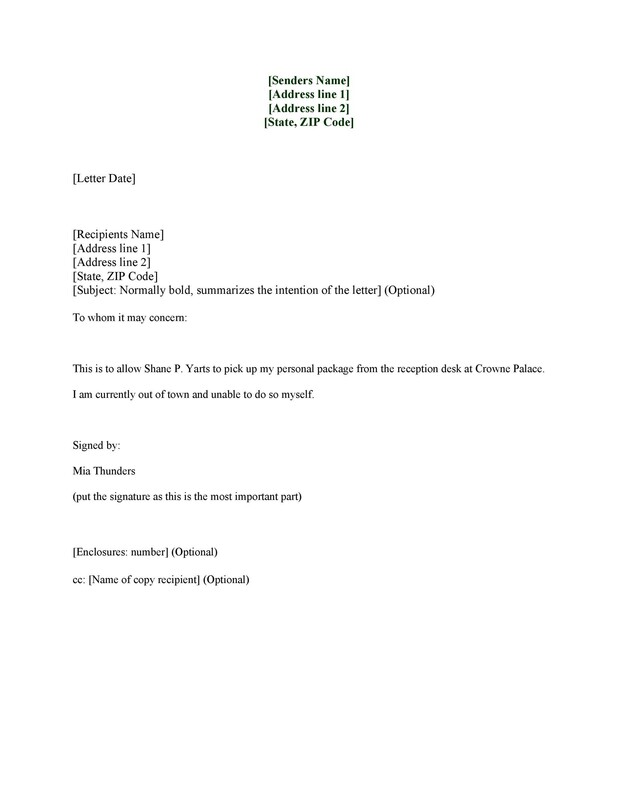 The letter spells out some specific tasks being designated to the third party. These tasks can be about anything but normally, they are for taking a loan, negotiating a contract or for accessing bank accounts. With respect to the law, the first party is bound by the actions of the third party. This is why letters of authorization must not be taken lightly because they are mostly financial in nature. 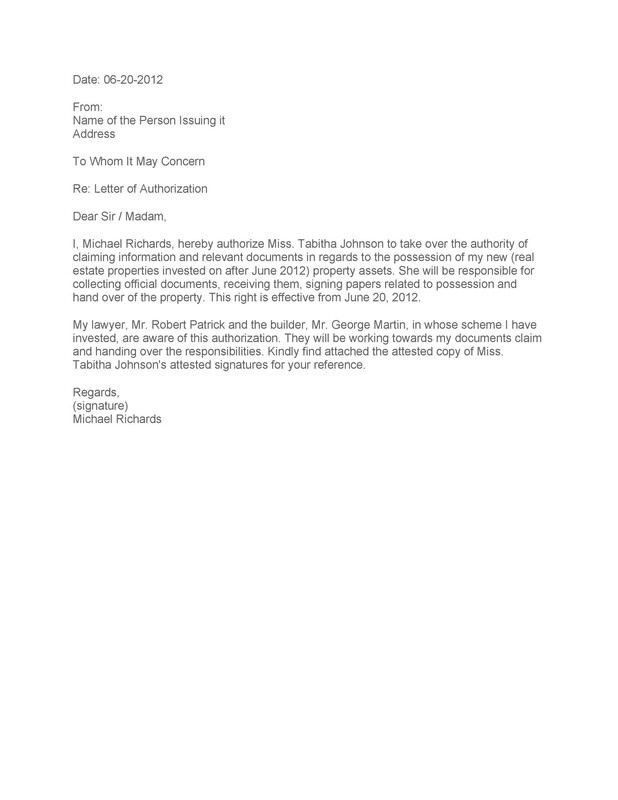 What are the Types of Letter of Authorization? As we mentioned above, the letter of authorization actually grants permission to another party to act on someone else’s behalf. 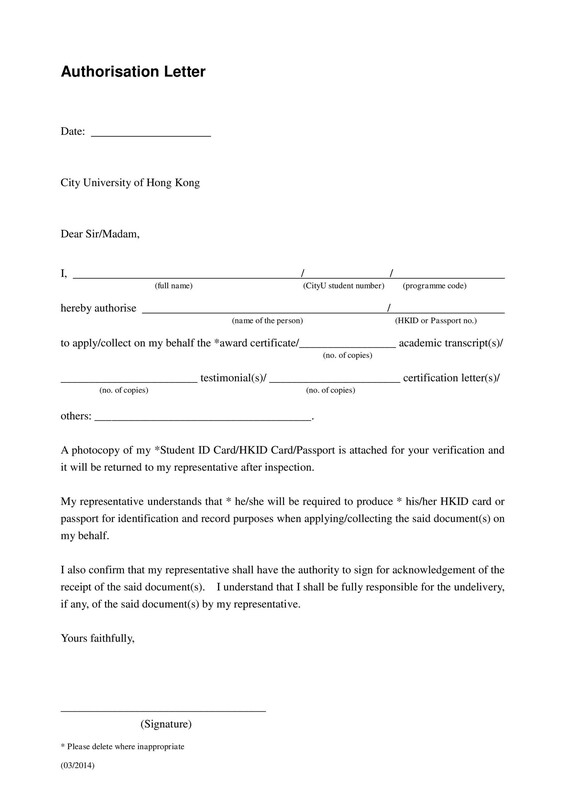 If you are a student, then you may need to add a letter of authorization. As a parent, you may need for it someone to look after your child. 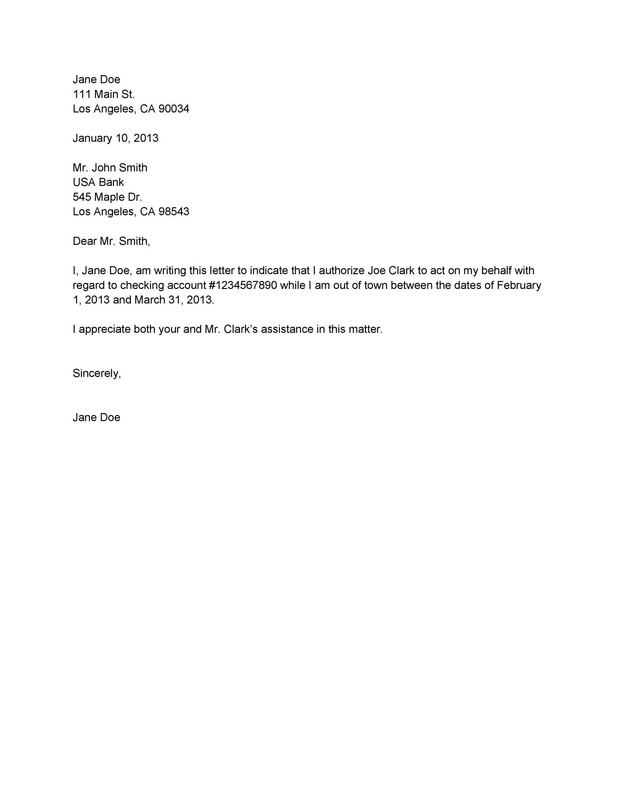 Given that an authorization letter is used for various reasons, you can write it for whatever reason you want. 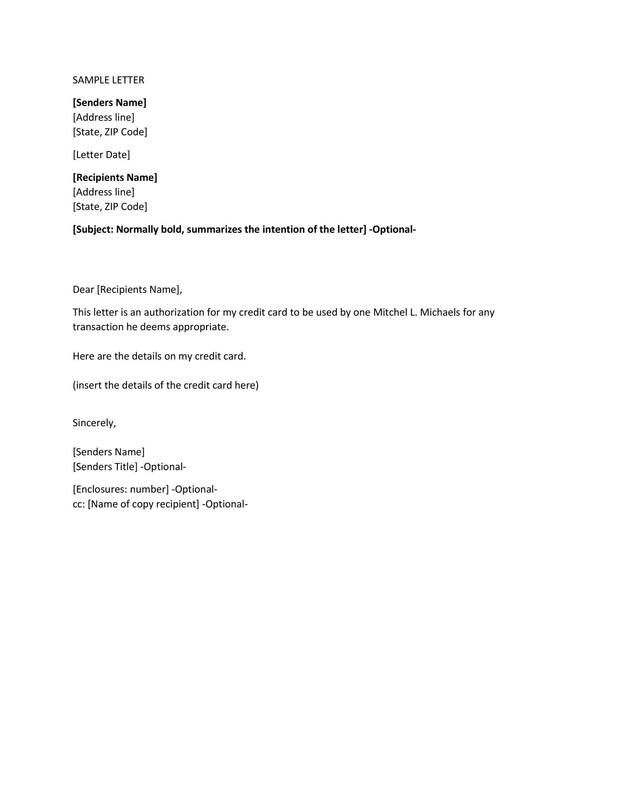 However, if you want to avoid errors and mistakes, then we suggest you download authorization letter samples or templates which are available on our website. 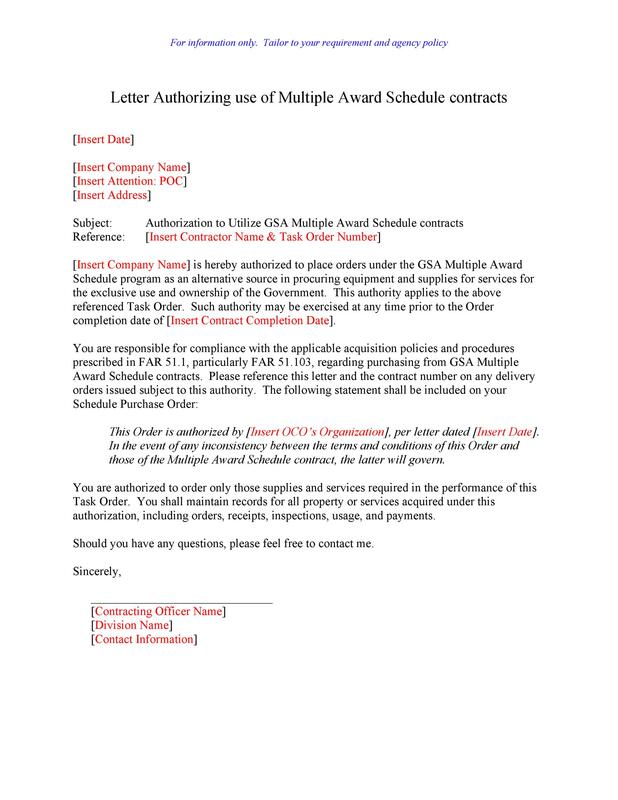 Here are a few types of letters of authorization that are commonly used. 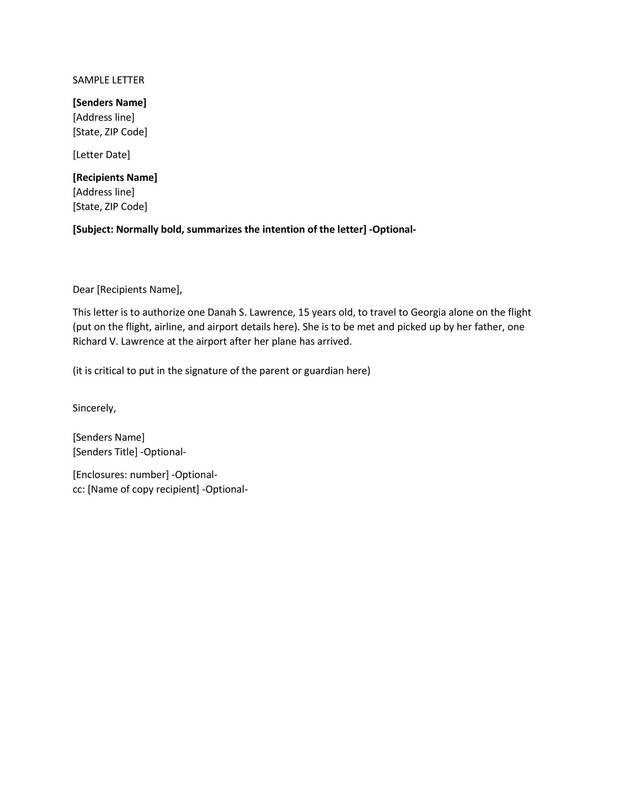 A travel letter of authorization is one of the types of authorization letters that are written by people who wish to give authority to someone else. They are merely given by them so that the other person can carry out their valuables and belongings or anything else of their use. 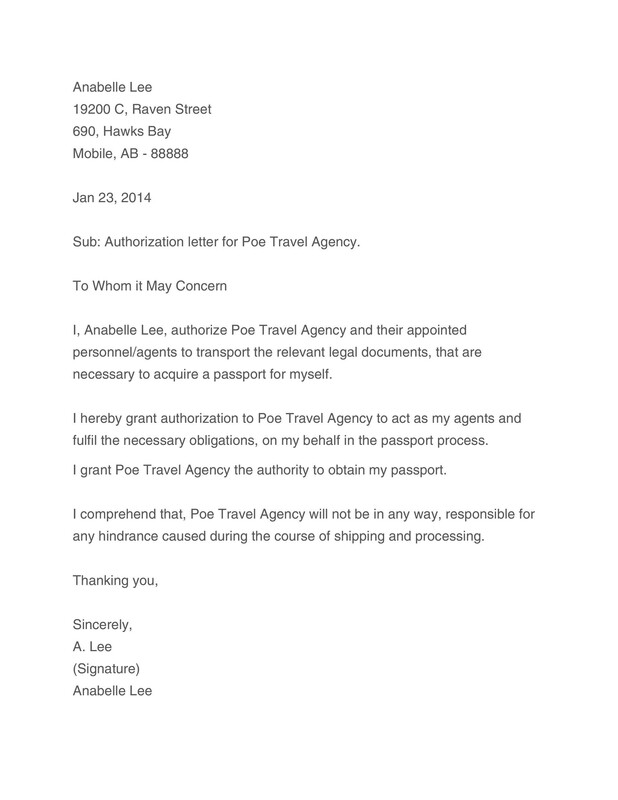 In a travel letter of authorization, the letter must address the higher authority of the travel department of the respective airline. 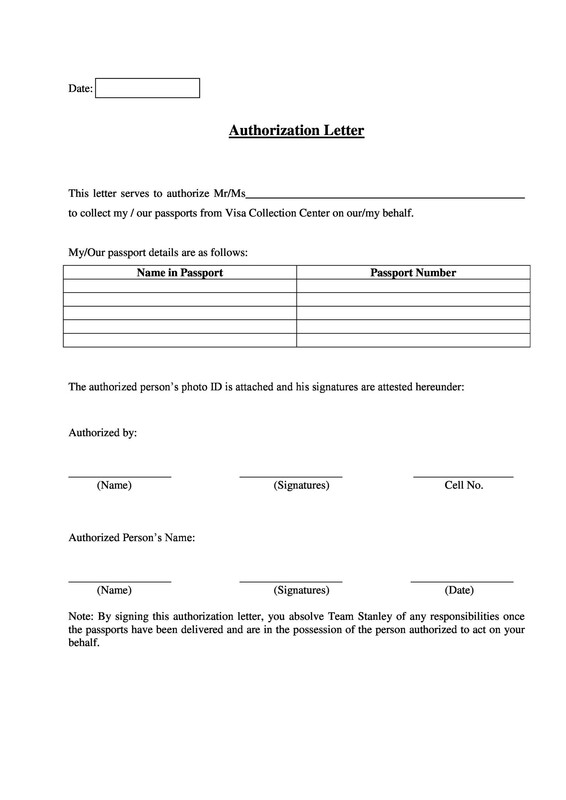 This form of letter of authorization should contain all the contact details of the person, flight details and passport details. 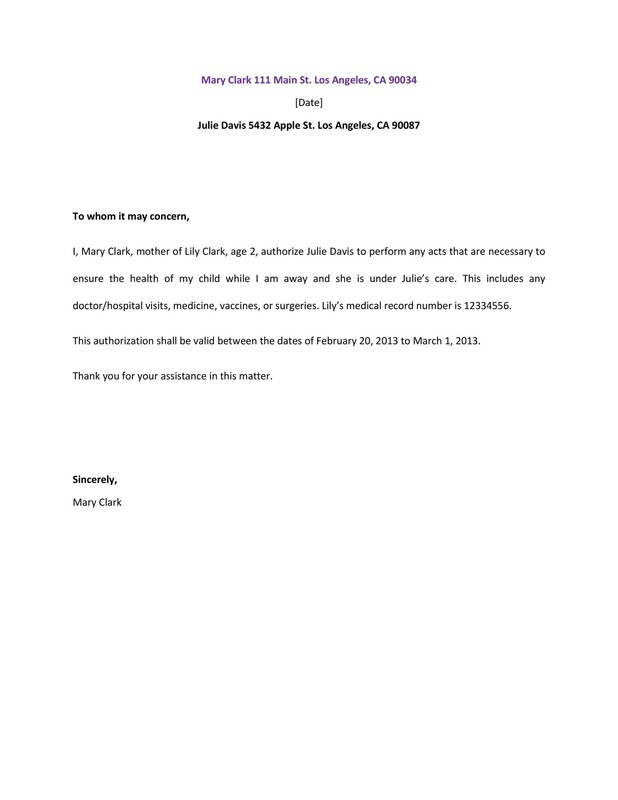 Medical letter of authorization is another popular type of authorization letter that is written by a person who wishes to write to the medical authorities. This type of letter is addressed to the high medical authorities, disclosing any medical information which might be needed. 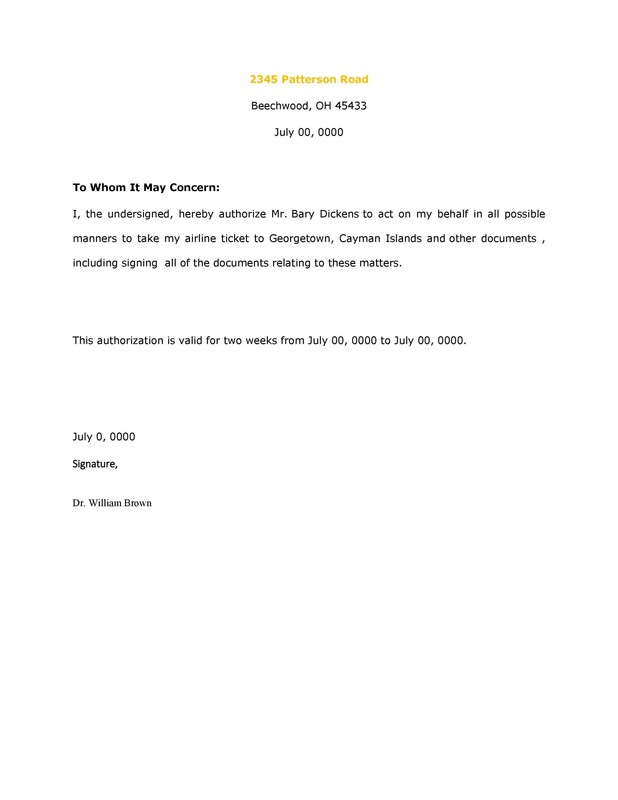 In addition to that, the letter of authorization signifies the consent on terms and conditions, detailed disclosure and the associated factors. Considering the medical letter of authorization, there is another authorization letter too, namely the Medical Treatment letter of authorization. 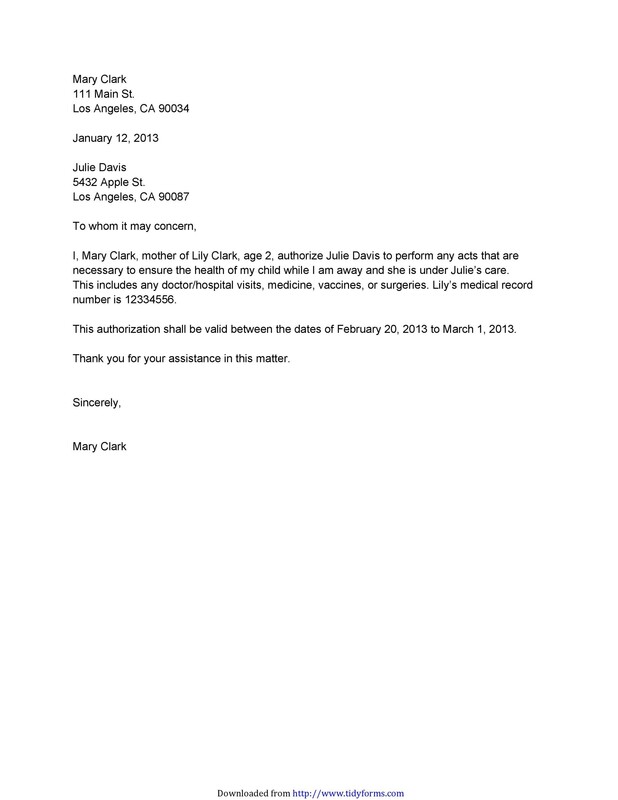 This type of authorization letter adheres to the human resource department of the hospital. Employees who are working with the hospital for a longer time period are legally eligible for the medical treatment by the hospital. Through this, they will be able to avail all the benefits. At times, their families are also given authorization. 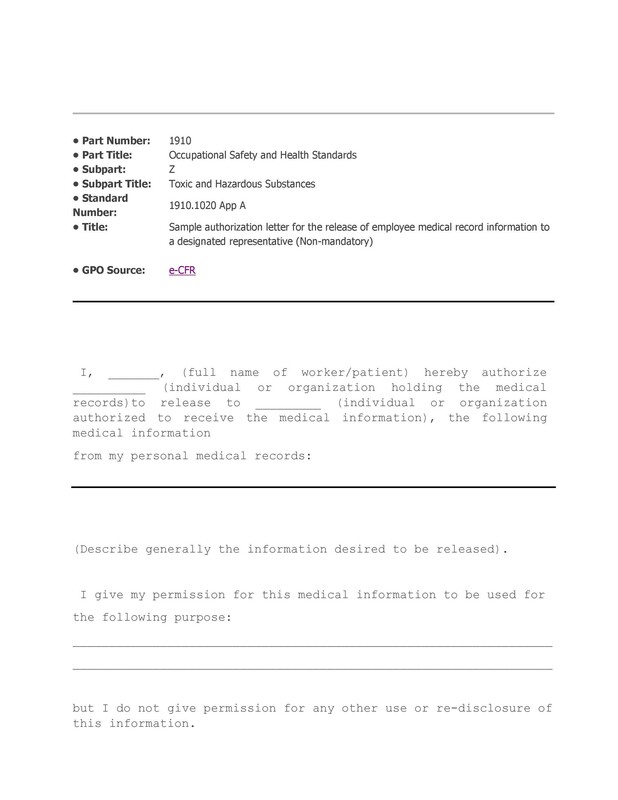 In order to avail that authorization, employees need to write an authorization letter that is a medical treatment letter of authorization to the human resource department of the hospital. This is yet another popular form of letter of authorization, namely third party authorization. This is written whenever there is third party in the process of a transaction. This is involved when the two parties declare its authorization. 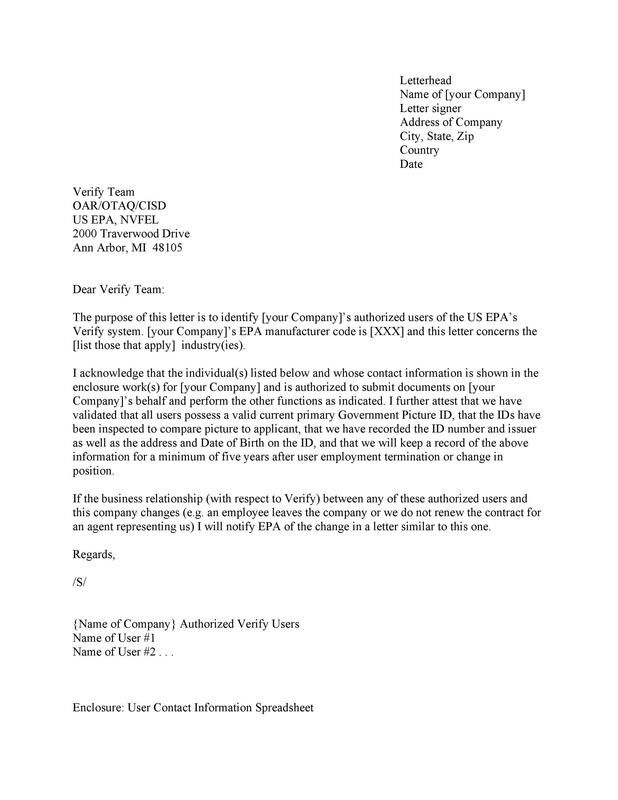 Additionally, this type of letter of authorization should be written by any of the two companies to declare the third party’s authority. 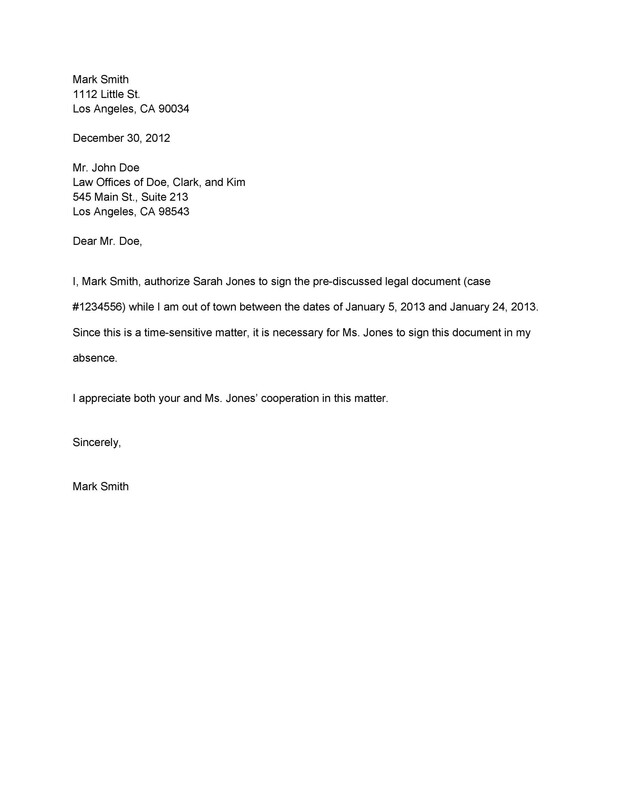 This letter clearly mentions the value and name of the third party in addition to the necessary legal aspects, including documents. The short sale letter of authorization is when an individual or an entity is looking for an authorization which is proved by the authority. 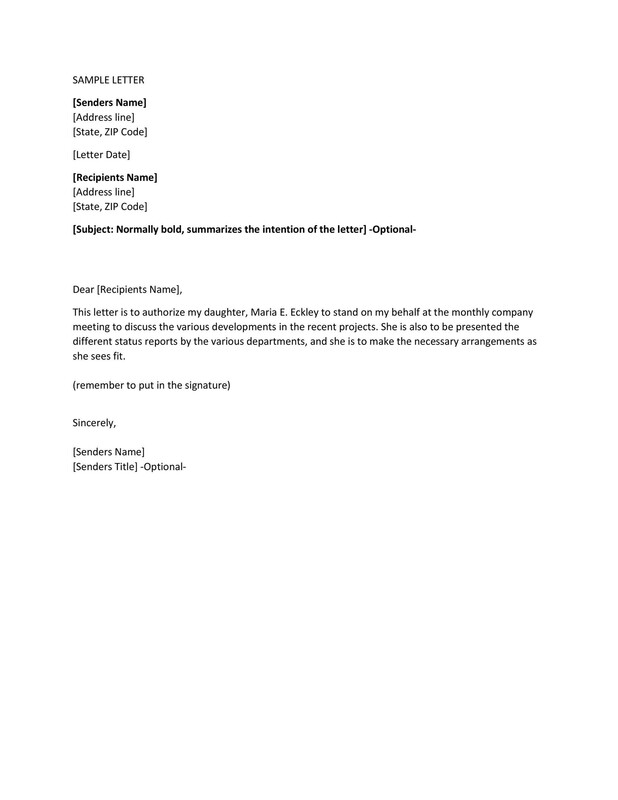 With the help of this approval letter, the concerned individual or the entity is given permission for the specific work to be done. 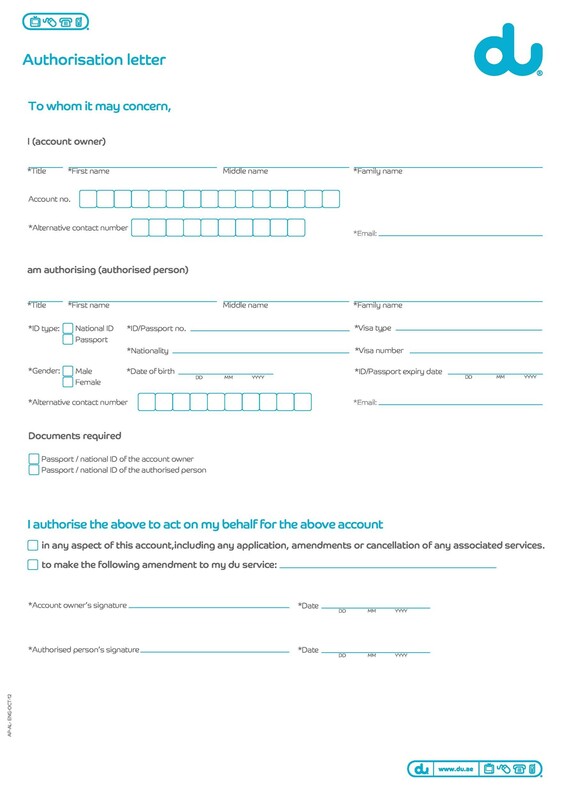 When the letter of authorization is being consolidated, then required documentation is done and the entity or the individual acts on the authorized tasks. 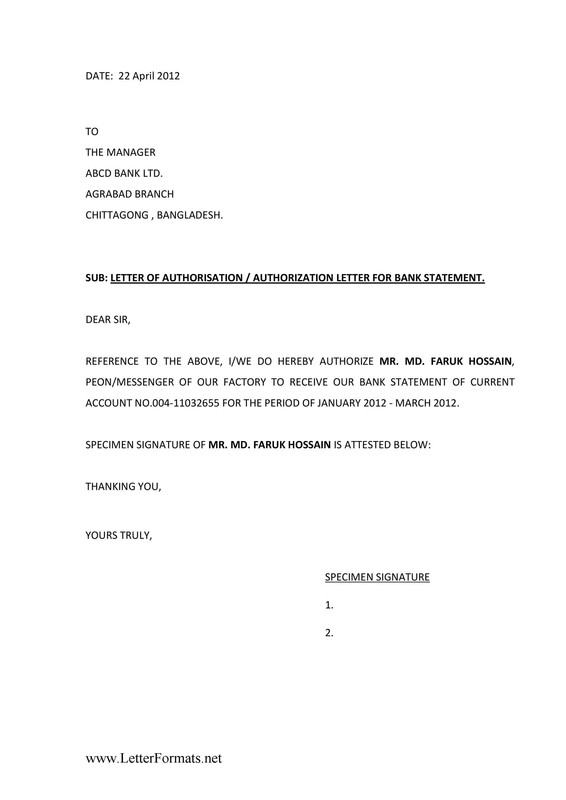 Moreover, there is another type of letter of authorization. Namely, the short sales authorization. 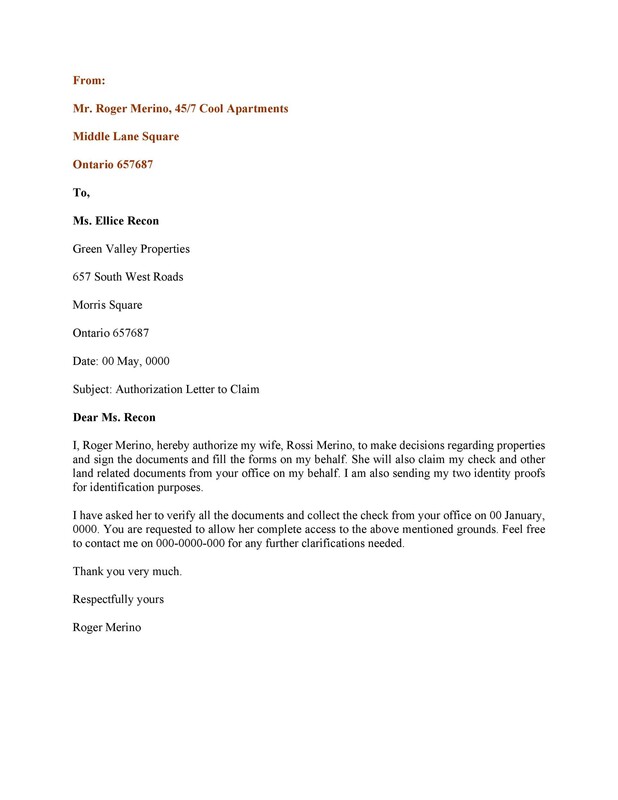 This type of letter has a proposal about a short sales program. After the sales program has been accepted, there will be a deal between the companies. Also, the profit resulting from the discount will then be given to the sales company. 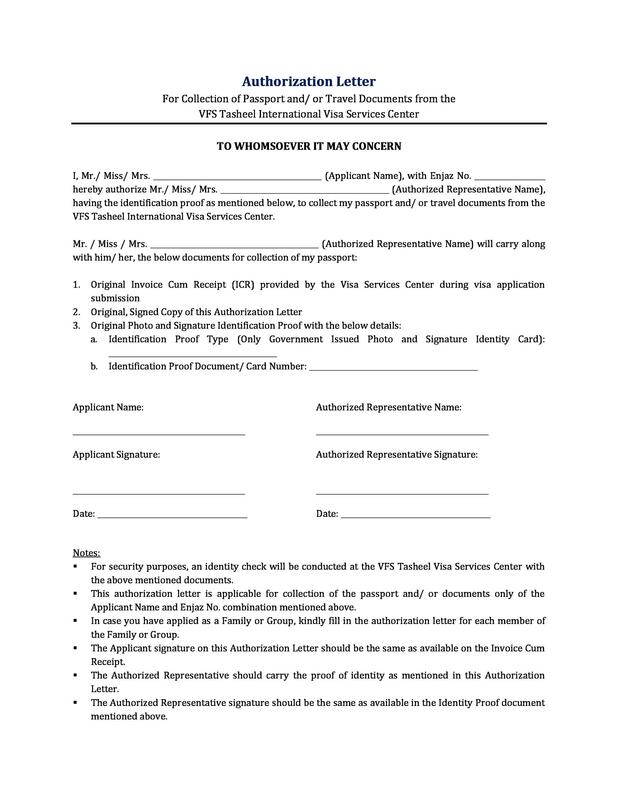 How to Write a Letter of Authorization? Now that you know a lot about the authorization letter, let’s see how it is written. 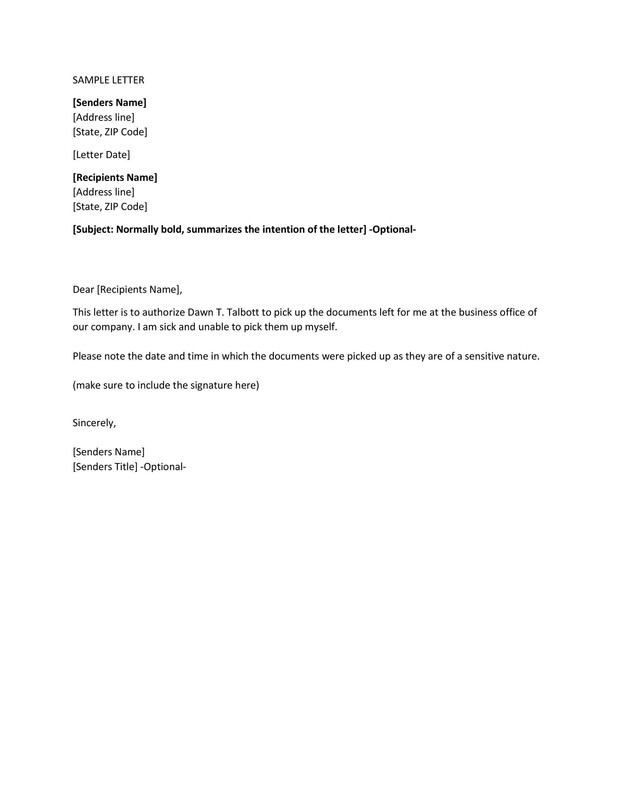 To begin writing an authorization, you should follow the standard format of the business letter. 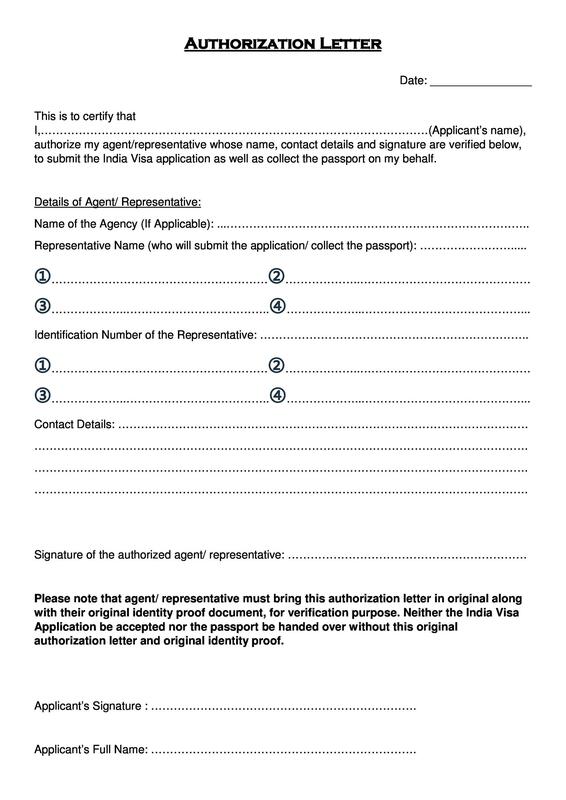 The first line of the letter of authorization should be written on the top left hand side of the page. You should write your name in the first line. In the second line, you should write about your street information (always ensure to write it correctly). In the last line, you need to write the name of your city, state and ZIP code. You should remember that all these lines should be single spaced. After writing about your name, address, street information, state, city and ZIP code, you need to skip one line and write the current date on the next line. Always write the full date, such as August 19, 2016. You should not write the date in a shortened form. 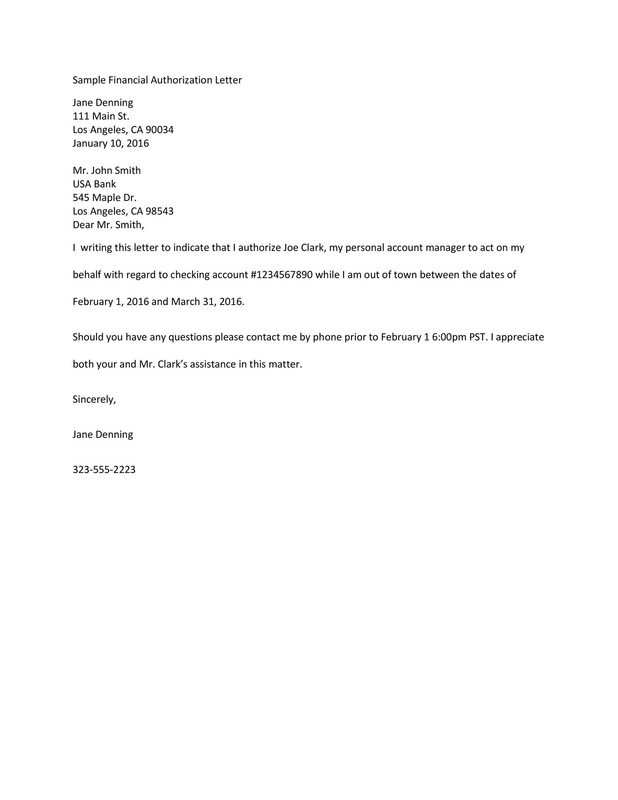 After writing the date, you have to leave one line space and write the recipient’s name and address. 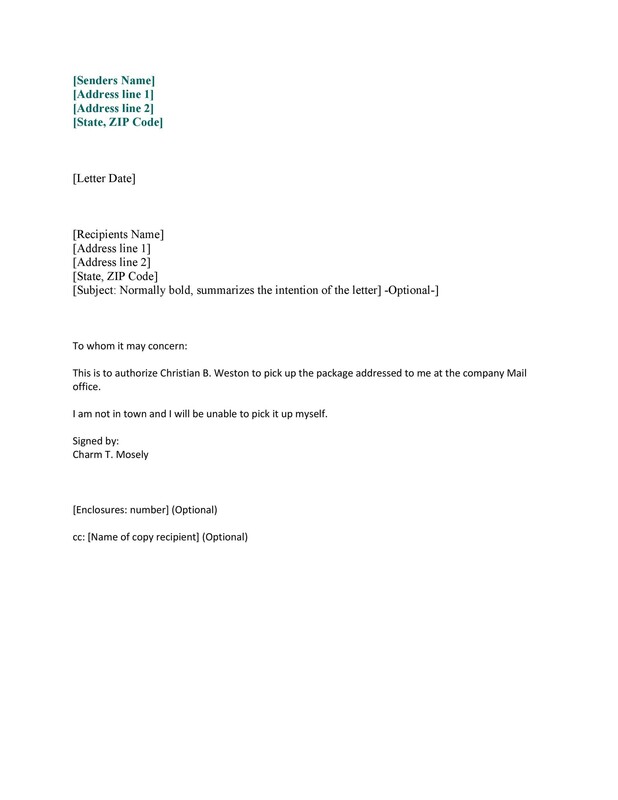 Just like the way you wrote all your information, you have to include all the information of the recipient in the same way. However, you should keep in mind that you are granting authority to them to act as a proxy. This is why they will be able to act on your behalf. So, the letter should always be addressed to the second party. 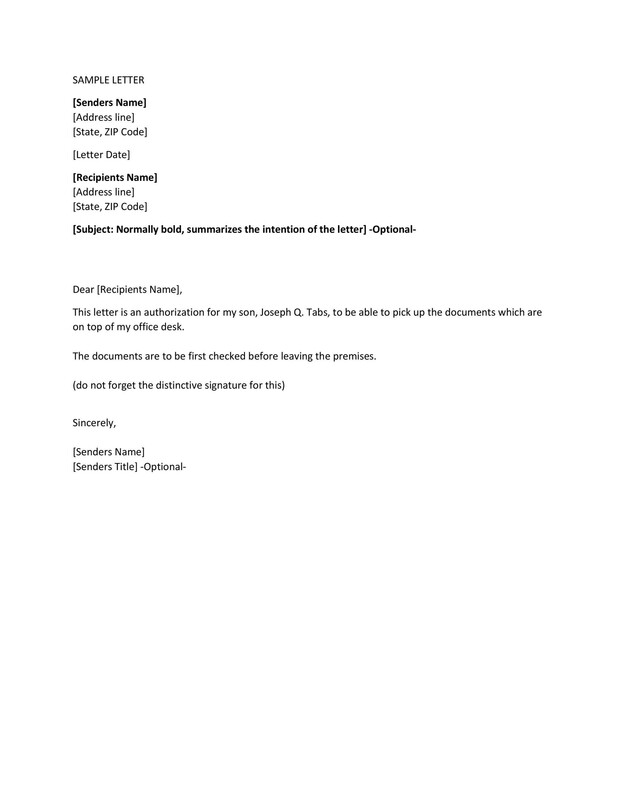 After completing the letter head, now comes the time to write the body of the authorization letter. 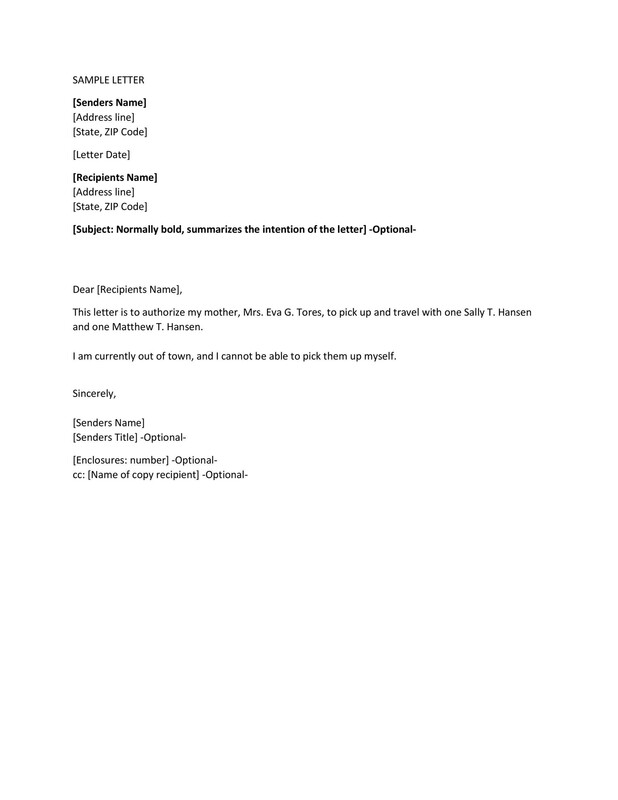 You should write the salutation using appropriate titles such as Mr., Mrs., Ms. and Dr. You should not use their first names. Also, the salutation should open with either To or Dear. Always remember to use the full name of the person to whom the letter is addressed. In case you do not know their name, you can include To Whom It May Concern. This is the step where you have to specify the duties and specific details about the authorization you are granting to the other party. This part need to be precise, concrete and short. This is because brief letters reduce the level of conflicting interpretations. 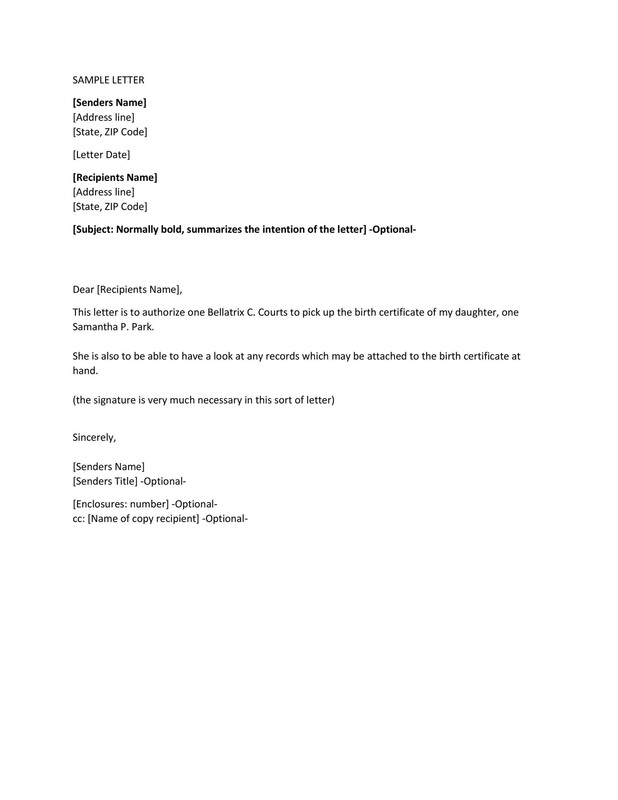 In this section, you should elaborate like I, (your name) hereby authorize, (proxy’s name) to carry out the following duties in my absence. Along with the duties, you need to mention why you require a representative to act on your behalf. Now that you have assigned and discussed the duties, this is the time to specify the dates. 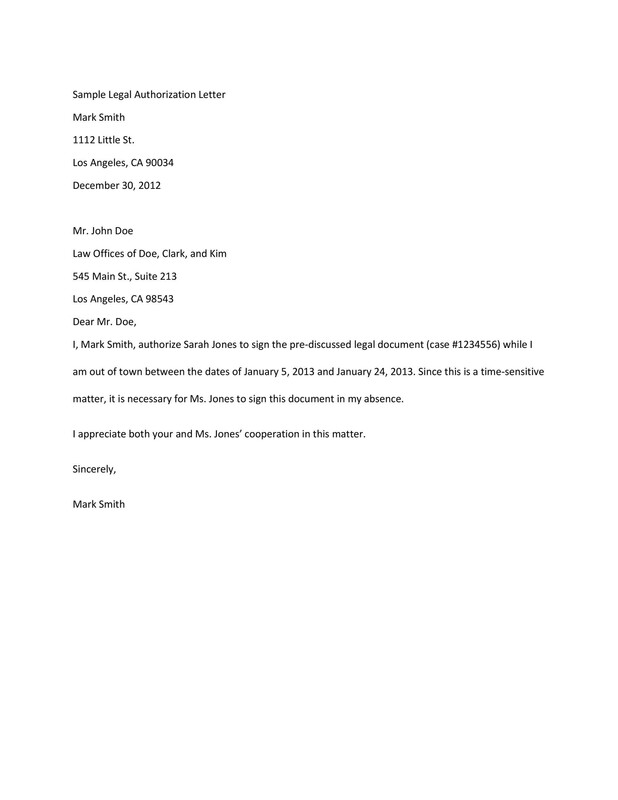 You need to write about the beginning and ending date the proxy has been authorized to perform certain actions. In addition to that, you should also write about the restrictions that the proxy is not authorized for. In the end, you should finish up the letter of authorization with a closure that is sincerely, thankfully and so on. After that, you should leave four lines for a handwritten signature and then write your full name underneath your signatures. You should also keep a copy of letter for your record. 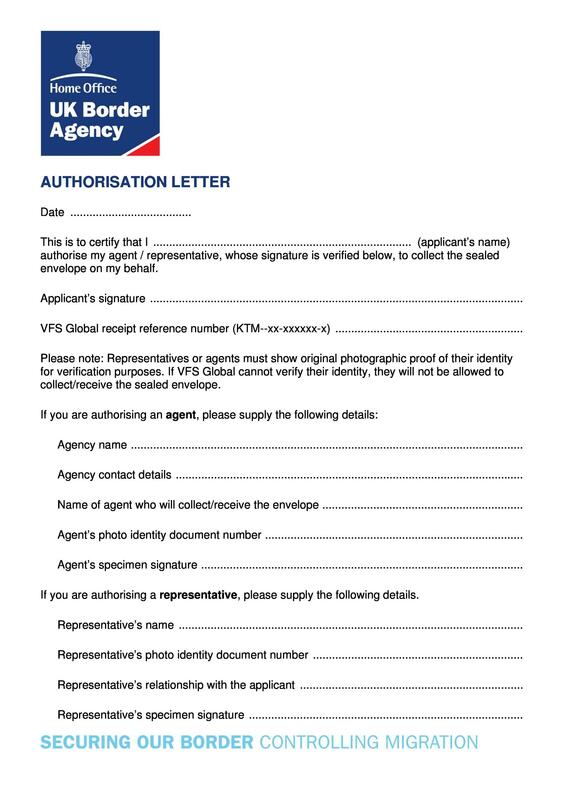 A letter of authorization can be used for various reasons. 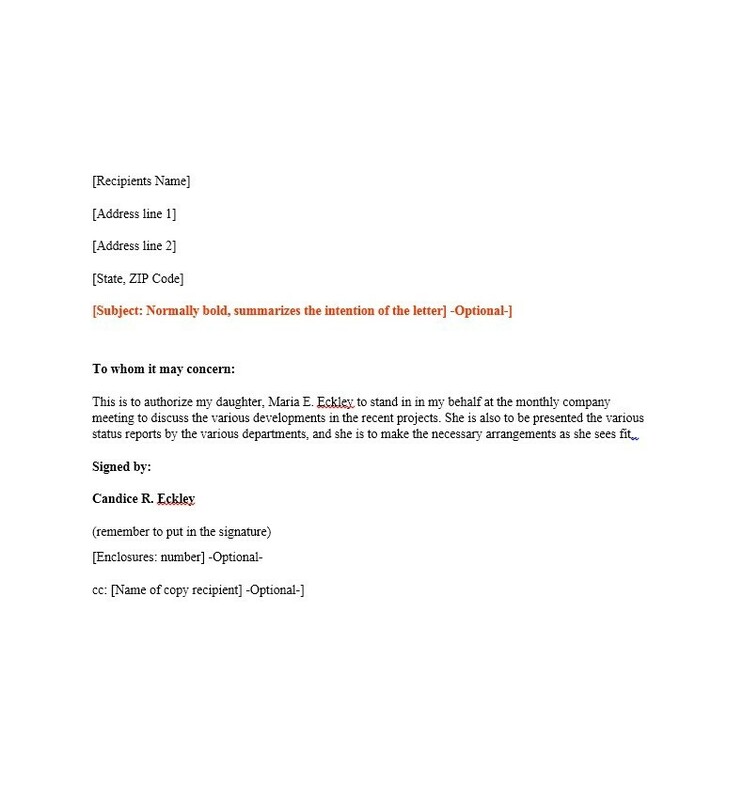 If you also want to avoid making mistakes and save your time, you can download an authorization letter sample from our website and edit it according to your preference. Good luck!